I decided that since the holiday parties are starting and the baking has finally stopped that I needed a healthy snack alternative to keep on hand and keep on track. All that snacking that happened during those wonderful holiday happenings has left me snack happy! 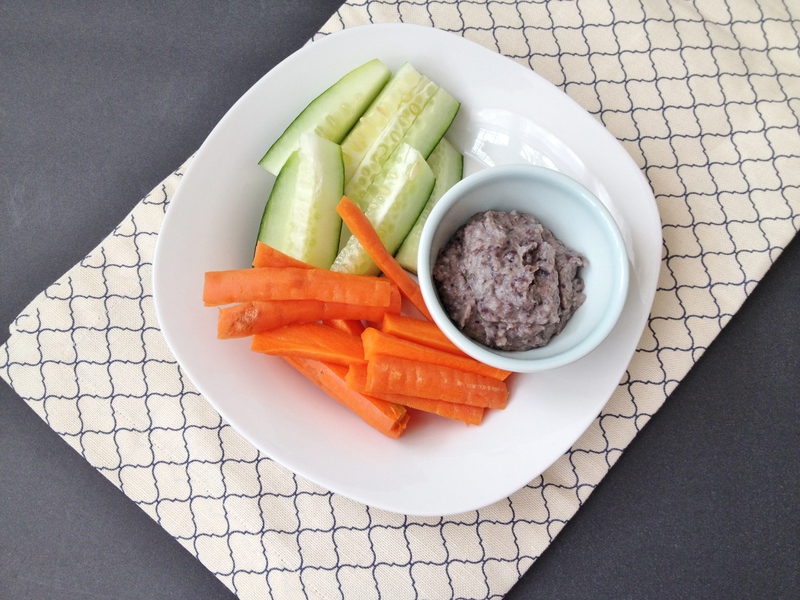 And what better snack is there than hummus with veggies? 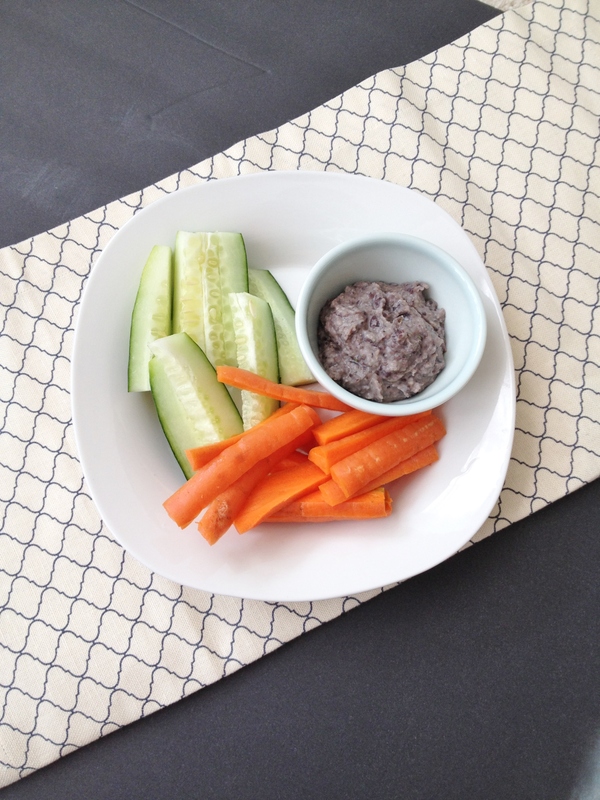 There is nothing really – especially when you keep remaking the hummus into something better each time! It’s especially great when a coworker wants to taste it and they are shocked to learn that 1. it tastes good (lol), 2. yes, you did make it yourself, and 3. that you did the beans yourself too. I love when people taste what I make and they like it – especially non-vegans! 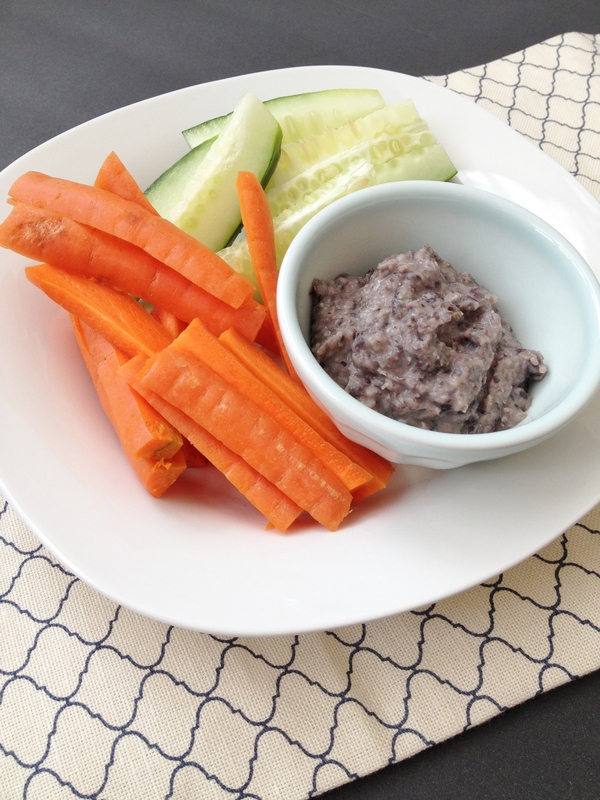 Here is another hummus recipe for your collection – Vegan Roasted Garlic Black Bean Hummus. I do love hummus. Having never really eaten it for a long time, I have really come to enjoy eating it and since I don’t get enough protein at all in my diet, the hummus is the best way to make sure I am getting a little something extra. This hummus came about by trying to figure out how to use up what I had in my cupboards and fridge already and to try not to buy anything extra. And well – all I had to buy for this was the $.50 bulb of garlic! I had the beans and just measured out half a bag of dried beans and soaked overnight – black beans like to give off there “black” color (it’s really purple!) so I poured out the water after a few hours then put in more water and let sit out overnight, then rinsed again. I rinsed the pot out and dumped the beans back in with enough water to cover the beans then put a lid on skewed and boiled on medium-low heat until softened. I roasted the garlic for 45 minutes with another recipe then added everything to the food processor and that was it. Dump dried beans into a bowl or pot and cover with water; let sit overnight – at least 12 hours. Dump water and rinse the pot and beans. Add beans back to pot and add enough water to cover beans then boil over medium-low heat with a lid on but skewed until softened. Roast garlic for 45 minutes at 350 degrees in a foil or parchment pack with a little oil and black pepper. 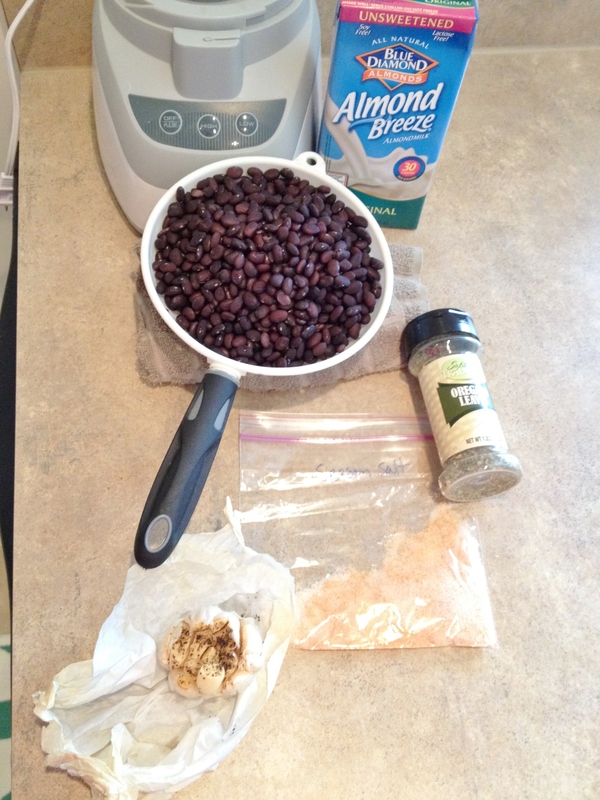 Once both cooled dump beans, squeezed out garlic and spices into food processor. Turn on FP and add a little milk at a time until everything is blending fine. Not a lot of milk is needed. Freeze leftover beans in a ziplock baggie for future use. Enjoy! 1. Soak dried beans overnight, rinsing once during the process. Dump water and rinse beans and pot. Dump beans back into the pot with enough water to cover beans. Bring to a boil then lower heat and put lid on skewed. Let cook until beans are soft. 2. Roast garlic for 45 minutes wrapped in foil or parchment paper. Cut top of bulb of garlic and drizzle with a little oil and sprinkle black pepper. 3. Let beans and garlic cool – you need to be able to squeeze the garlic out without burning your fingertips off. 4. 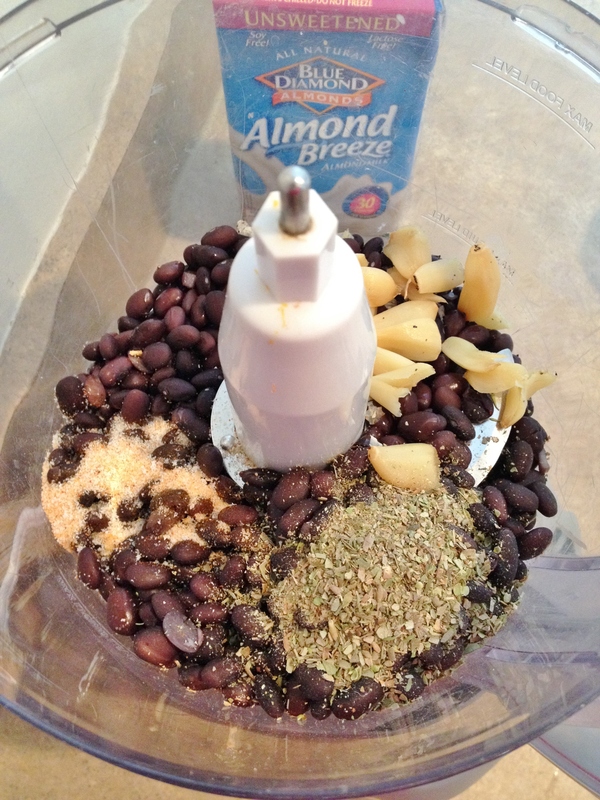 Dump beans, squeezed out garlic and spices into food processor. 5. Start FP then add a little milk at a time until everything is blending. It won’t be super-smooth, but it will be smooth enough to scoop up with veggies.